A Vampire Assassin and a Book of Evil. With the Empress’ soul bound into the pages of a book, all Gartan the Cursed has to do is destroy it to be free of her forever, free to wreak his vengeance on those priests and nobles who treated him like a subhuman animal, free to return home to the ruins of a city he ruled centuries before. But the Empress did not escape from Hell by accepting Her fate, and She is nothing if not cunning. 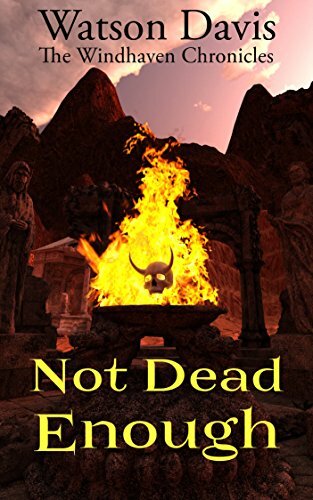 In this collection of sword and sorcery short stories set in the world of Windhaven, Watson Davis takes us on a harrowing series of adventures through ghost towns and vibrant cities, into the mouths of angry volcanoes and across stormy seas filled with monsters. This book shouldn’t be classified as a book 2. This is a book that takes place in the Windhaven world and it actually takes place years after the events of The Devil’s Library. The Empress, who was introduced very briefly at the end of The Devil’s Library, has been defeated and her soul imprisoned in a book. Gartan, the leader of the Onei, was the one who defeated her and the rebel, Dyoh Mun….who was the only person who could destroy the book and effectively destroy the Empress for good. So, Gartan takes it upon himself to go and destroy the book. Which turns out to be easier said than done. This book was a tad gory but hey, Gartan is a vampire and they tend to be…messy….when they feed. But he also had a conscience, which I enjoyed seeing. He stopped from killed a young girl and her mother after they witnessed him feasting on the husband/father. He actually treated the young girl with respect and in doing that, he gained points with me. He also saved a slave girl from the awful innkeeper and set her up for life. So, he couldn’t be all that bad, right. Gartan is a bad, bad man who is trying to defeat his maker. He ended up getting rid of magic and couldn’t be controlled by it anymore but he couldn’t destroy the book. Every person that tried to destroy it either died while trying to destroy it or Gartan killed them. He tried everything. Dropping into a volcano….didnot work. Dropping into the sea…didnot work. Going to various magicians to see if they could undo the spells…..didn’t work. It was finally at the end of the book that Gartan was told something that he didn’t like. Want to know what? Read the book. I will admit, I did laugh at some points during the book. The little girl telling Gartan off shouldn’t have made me laugh but it did. The thieves trying to break into Gartan’s room and not being very smart about it, made me laugh too. I was sad to find out about what happened to Windhaven and I do hope that Gartan’s son and his family was able to escape. Reading this book made me want to read these books even more. I can’t wait to read the next book in this universe and see where it takes me!! Why: This was a not so typical vampire story and I loved it. The humor in this book, very tongue in cheek, was awesome to read. It is a bit gory for those who don’t like that but that didn’t detract from the story for me.